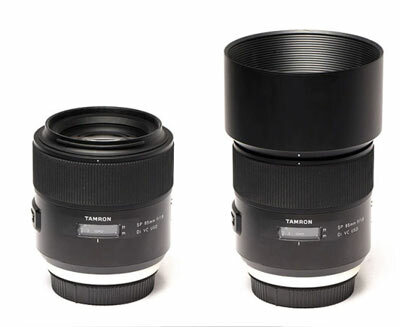 The Tamron SP 85mm f/1.8 Di VC USD is a high-end lens, part of Tamron’s Super Performance range, aimed at the serious photographer or professional. The lens bucks the trend in the prime market being f/1.8 rather than f/1.4, but it does have the advantage of image stabilization. As a top end lens, it does have an accompanying price tag to suit, but we will see if all the elements are worth it and if they are as good as the competition. As you would expect from a top-notch lens, the build quality is extremely solid and looks-wise being quite Zeiss-like in appearance, having a smooth finish and simplistic layout. This won’t be everybody’s cup of tea, but it does give a nice classic look to the lens. The optical construction consists of 13 elements in 9 groups, with 1x XLD and 1x LD element and an expensive Fluorine coating on the front element. Internally the lens has nine rounded aperture blades, a minimum focus distance of 0.8m, a filter size of 67mm and is rated as having moisture protection. There is no mention of dust protection, unless that’s a given with the moisture protection. The front of the lens is quite recessed which can attract dust, but there is a barrel-shaped lens hood supplied if needed. The front of the camera has a smoothly operating focus ring, with a distance scale, an autofocus and manual focus button and another for image stabilization. Tamron’s stabilization system(VC) is rated at 3.5 f-stops, which means if you’re missing that the extra provided by f/1.4, the stabilization should at least make up the difference in the shutter speed department. Everything on the lens weighs in at 700g. Being a prime lens and a top of the range model from Tamron, images are initially very sharp, even when wide open. Lens distortion or the pincushion effect is minimal across the aperture range. Vignetting is also minimal when wide open, but stopping down to f/2.8 clears things up completely. The same goes for Chromatic Aberration which is very low across the board. Sharpness of images is impressive wide open at f/1.8. There’s a very small amount of corner softening, but any that is apparent is quickly reduced stopping down to f/2.2. There’s really no complaint of center sharpness throughout the range, with the ultimate sharpness at f/4. Diffraction starts to come in from f/11, which is to be expected from this a lens in this range. This may be one of the reasons why Tamron have stuck to f/1.8 instead of f/1.4, so what you lose in a bit extra shallow depth of field, you make up for in ultimate sharpness. An f/1.8 lens also cuts down on ultimate weight and bulk which could also be factored into the final design. Speaking of the ability to produce nice background blur or Bokeh, f/1.8 produces a nice smooth background and some reasonable highlights, but they can sometimes suffer from some purple fringing. Stopping down a touch produces more pleasingly round highlights and also stops any smearing of any foreground subjects. The image stabilization system is almost an added bonus for a prime lens at f/1.8, but it’s there if you need it. 3.5 stops extra of shutter speed can’t be sniffed at and it does what it says on the tin with some impressively low shutter speeds available when handheld. Overall, the lens produces impressive sharpness across the aperture range and it only needs a slight stopping down to produce the sharpest of images and great looking background. Depending on the camera body you use, there’s some stiff competition in the 85mm range. The Sigma 85mm f/1.4 DG HSM ART is one such contender aimed squarely at the professional and has a faster lens at f/1.4. Optical qualities are roughly in the same ballpark, but the Sigma is far more expensive and doesn’t have image stabilization. Canon produces an f/1.4 and f/1.2 which are both incredible lenses, but themselves cost far more than the Tamron. At the other end of the spectrum, there is the Samyang AF 85mm f/1.4 EF which is faster, has a similar price point, but optically not as good as the Tamron. The lens is solidly built to professional standards, with the autofocus system being fast and accurate. In low light conditions, the image stabilization is a great addition and will work far better than an f/1.4 lens. There’s definitely no complaint about the Tamron when it comes to sharpness across the board. Any semblance of vignetting, distortion and slight corner softness are completely eliminated when stopping down. The only real downside is the quality of the bokeh where ironically the background blur is creamy, but foreground subjects are not as smooth as hoped. Highlights also suffer a little when the lens is wide open, but a little stopping down cures things. 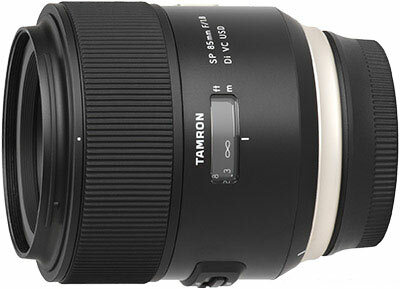 Pricewise, the Tamron SP 85mm f/1.8 Di VC USD is quite costly for an f/1.8 lens. Costing a lot more money than the aging Canon EF 85mm f/1.8 USM, but the Canon doesn’t have image stabilization. However, image stabilization can make a lot of difference, especially when using this as a more all-round lens and it’s not always the case where you need the shallow depth of field provided by an f/1.4 lens, especially when considering the extra cost. The Tamron’s advantages definitely outweigh its disadvantages, with great image sharpness across the board. It maybe an expensive lens for an f/1.8, but one that will give you great image quality for years to come.